Shannon Harrigan (front) and Jack Fricka (back) set up in the Wolverines full-court press. That press came up with key steals late. 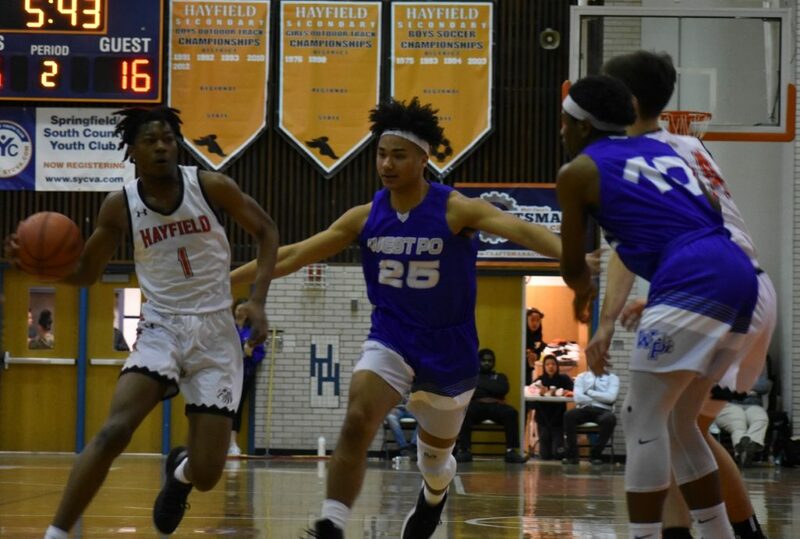 In a nip-and-tuck close game with rival Hayfield Thursday night, West Potomac got by in the fourth quarter on two of its strengths–offensive rebounding and defense. Those two attributes helped the Wolverines score 19 fourth quarter points en route to a 54-50 victory over the host Hawks. While both teams played good defense most of the game, rust from a couple day snow lay-off was apparent as both teams’ offenses didn’t appear particularly sharp early. Hayfield led 36-35 after three quarters in a surprisingly low-scoring game. After a Daniel Peterson three-pointer gave Hayfield a 41-37 lead, West Potomac reversed the tide. A Jonas Munson put-back on a missed shot closed the deficit to two. The Wolverines allowed Hayfield to score, but then scored next off a Shannon Harrigan offensive rebound. Then Daryl Mackey, Jr. got a steal and got the ball to Munson for a dunk. It all happened very fast. Center Jonas Munson had a nice game offensively, but was especially impactful on defense. So did the next West Potomac run. With Hayfield leading 50-47, West Potomac guard Bradley Harden buried a three–his first points of the game. Then immediately Jack Fricka got a steal and took it the rack for a dunk to make it 52-50, visitors. After a Munson block and a Harden free throw made it 53-50, Hayfield had a chance to tie but Peterson missed a couple of three-pointers. Another Harden free throw with 1.7 seconds left iced it. Munson, who pushes seven feet tall, produced a ton of blocks in addition to the key one he had late. 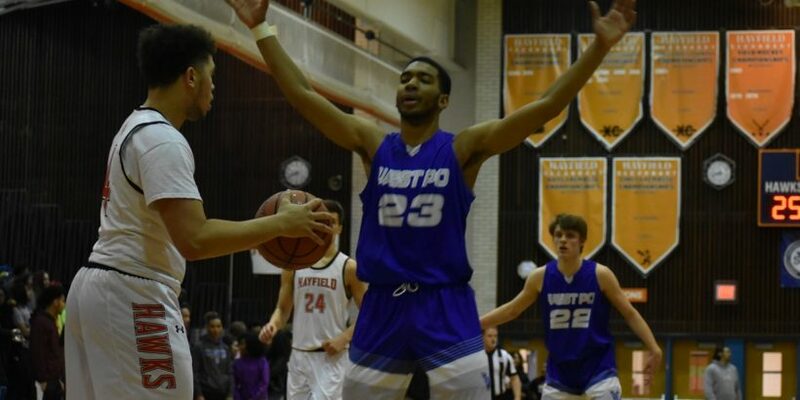 He was dominant defensively in the second quarter when West Potomac held Hayfield scoreless for six minutes. On the offensive end, he had 11 points and seven rebounds. The explosive guard Mackey led West Potomac with 14 points, still really an off night for him offensively. Even so, he was good defensively and his mere presence opened things up on the floor for everyone else. 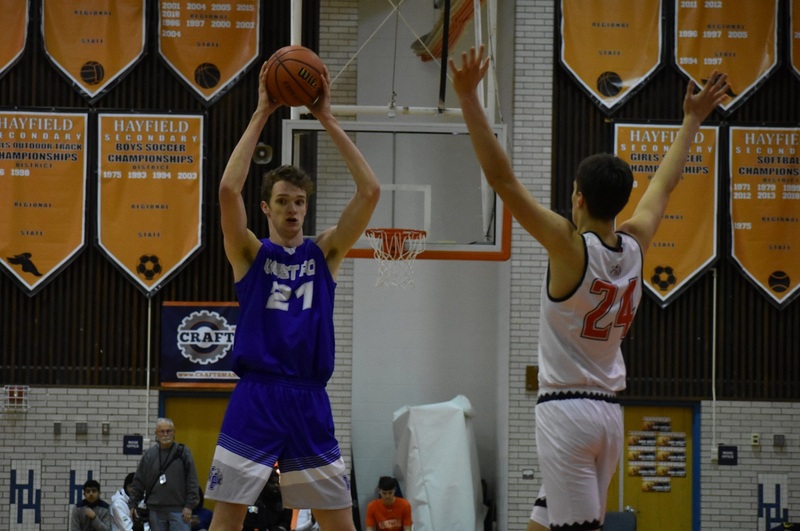 Fricka and Harrigan got off to slow starts but finished strong–Fricka with the key steal/dunk and 13 points overall, Harrigan with eight points 10 boards. All of Harden’s five total points came in the clutch as the guard continues to come up big for Houston’s team late. Hayfield’s Mike Joiner (13 points) drives the lane. He was explosive despite a foot injury. The win allowed West Potomac (5-0, 15-3) to remain undefeated in the Gunston District and sweep the season series with its rival. Meanwhile it was another bitter loss for the Hawks (3-3, 11-6), who lost the first meeting between the teams on the road by only two points. The Hawks have more than demonstrated they’ll be a postseason threat to West Potomac in the district and to everyone at regionals, however. They impressed on Thursday with some good defense of their own. They also impressed by out-rebounding West Potomac, one of the tallest teams in the area. Mike Joiner, battling a foot injury, led the way with 13 points for the Hawks, while Peterson added ten. Jahvon Hutchinson added eight points and was a factor getting to the line late.